You only need to take a look around you to see that most everyone in so-called civilized nations are actually pursuing an “accelerated aging program”; one that leaves us feeling old and exhausted long before our time. 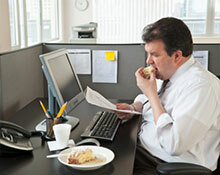 Consuming a diet of primarily junk foods and fast foods and leading a sedentary lifestyle are the primary culprits. You may enjoy lying on the couch doing nothing but “flipping channels, drinking beer and eating whatever fat laden snack may be close at hand now…but the “silent damage” that is occurring behind the scenes is what will dictate the state of your health in your future years. Keep this type of lifestyle up and eventually just getting off that couch or comfort chair of yours turns into a major struggle as the functions of daily living become more difficult from lack of muscle mass and tone. What is accelerated aging syndrome? “If you don’t use it (your body) you’re guaranteed to lose it-to disease, weakness and injury. Truth is, you and everyone around you begins losing muscle and gaining fat every day from their twenties on. This loss is so subtle and gradual that most people don’t even notice until the damage has been done. We can no longer blame our muscle loss on aging…experts agree that most of our muscle loss occurs because we stop doing active things that require muscle power. We simply stop using our muscles so they go away. In other words, lack of activity is the quickest path to muscle loss. Once your muscles begin to deteriorate, the “domino effect” is set in motion as it weakens the body. The immune system, nerve cells, hormones and chemicals are all adversely affected. Rather than address the “real reason” why they are losing the ability to perform daily tasks, people choose to shy away from any task they can no longer perform comfortably, leaning on the age old excuse of “aging”. However, the good news is that it is possible to “turn back” the aging clock and dispel the myth that as we grow older we grow weaker”. Muscle weakness, bone loss, sluggish metabolism are changes that accompany aging but are not solely caused by it. The human body was not meant to be still. Lack of movement is devastating to the human body. All you need to do is take a look at those who are bedridden in a hospital…they quickly lose muscle mass and flexibility as well as strength and range of motion…all within a few days. Exercise can slow and even reverse many of the components of the aging process and is still the single most effective way to lengthen life…it truly is the closest thing to an anti-aging pill. It can literally take years off your chronological age and add years to your life and life to your years. The closest thing to a “magic bullet” for the “fountain of youth” is physical strength. Fitness is the real “key” to health and longevity and a good quality of life. The amount of muscle you have and how much you retain is determined partly by how much you use your muscles…if you use your muscles frequently you will maintain their present strength…however, if you push your muscles to the limits of their capacity through exercise and strength training, you can actually increase their strength no matter what your age. Muscles are the engine of our body…it’s where energy is released and power is produced. It’s where movement originates and has everything to do with the way we look, feel and function. Plain and simple: strong muscles are very advantageous. Proper exercise not will not only keep you younger longer but it keeps chronic disease away by virtue of a stronger immune system. Cancer is one of those chronic diseases and I’ve created a simple free test you can take to find out where you stand on the “cancer risk scale”.